On May 3 through 5, the 16th WCSC(World Computer Shogi Championship) was held in Chiba Prefecture, Japan. 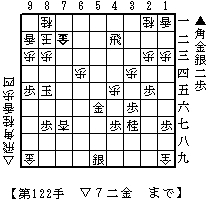 WCSC is a championship of shogi software programs. Both commercial program and non-commercial program can participate the tournament. Bonanza, a shogi freeware created by Kunihito Hoki, won the tournament. You can find the result of the tournament in the post to shogi-l by Takizawa-san who is the chairman of Computer Shogi Association. Since it was first time for Bonanza to take part in the tournament, it had not seeded and had to compete others in the preliminary leagues in the first and second day to go to the final league in the third day. Bonanza passed the preliminary tournament on the first day with the score of 7-0 and did the preliminary tournament on the second day with the score of 7-2. It was defeated by Bingo-shogi in the round 2 and by TACOS in the round 9. The five top program could go into the final league on the third day. Bonanza occupied 2nd place in the preliminary tournament, while Ohtsuki Shogi took 1st place. If Gekisashi found the mating line, Bonanza should have had two defeats and could not have won the final league. Here was another luckiness to Bonanza in the round 6. The game between YSS and KCC ended with Sennichite and neither of them gained a point and their scores were 4 wins, 1 defeats and 1 draw after the round 6. Bonanza's score at the same time was 5 wins and 1 defeats. If YSS beat KCC, then YSS might have won the tournament if the scores of YSS and Bonanza were the same(6-1) after the final round since YSS beat Bonanza in the round 1. Anyway, it was great accomplishment for a shogi freeware to become the winner of the tournament in computer shogi history. Beyond these things, a business financial consultant will use various CFO services to help you develop an idea for things like anticipated cash flow.